At a conference in San Antonio in 2007, Doug Reeves asked participants to determine the unit or topic grade a student should receive given the data in Figure 1.1, using each of three grading scales. The grades in Figure 1.1 are all on the same topic or skill, all comprehensive, and all of the same weight (all tests, or all labs, or all demonstrations). Note that under Method 1, the method most often used in the United States, the student receives a failing grade in spite of strong performances near the culmination of the unit or grading period. On the other hand, by changing nothing but the intervals between scores (Method 2), the student receives a C− for the same level of performance. Source: Used with permission. Adapted from Elements of Grading: A Guide to Effective Practice (2nd ed.) by Douglas Reeves. Copyright 2016 by Solution Tree Press, 555 North Morton Street, Bloomington, IN 47404, 800.733.6786, SolutionTree.com. All rights reserved. 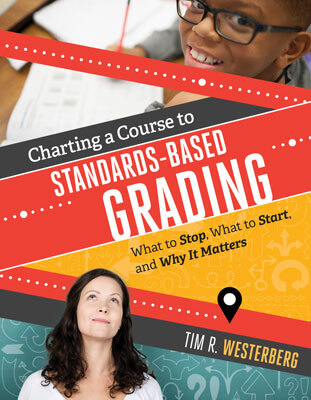 It should be obvious that for students in this or similar situations, the scale the teacher uses to calculate a final topic grade makes the difference between passing and failing the topic—and perhaps between graduating or dropping out of school. If your son or daughter were in this class and struggling, would it be OK with you if the computer assigned him or her to a teacher using Method 1 when a teacher of the same course across the hall used Method 2—and if the principal defended the process in the name of academic freedom for teachers? Using your teacher judgment (Method 3), what final topic grade would you give this student, unencumbered by a district-mandated grading scale, if the criterion were assigning a grade that best reflects the student's demonstrated mastery of topic content and skills at the end of instruction? Posing this question to thousands of teachers and administrators at workshops and conferences over the last decade consistently yields results of more than half of each group indicating a grade of A or B based on the student's growth and performance at the conclusion of instruction. Depending on the scale and method of grading chosen by individual teachers, a student could earn anything from an A to an F for the same academic performance. So much for the accuracy, objectivity, and fairness of traditional grading practices. Why do we insist on using an assessment and grading system that yields results that fly in the face of teacher judgment? It is common practice in U.S. schools for teachers to enter zeros into the grade book for missing assignments. The effects of this practice on students' grades vary considerably depending on the type of grading scale used, but the most counterproductive effects accompany the most commonly used scale—the 100-point or percentage scale. In addition to the problems associated with mixing academic performance with work ethic (a topic covered in Chapter 3), there are at least three reasons why using zeros for missing work on the 100-point scale is counterproductive. The first reason is mathematical. For example, with a grading scale that uses intervals of 60–69, 70–79, 80–89, and 90–100, there is a 60-point gap between a zero and a D, whereas a gap of only 10 points separates a D and a C, a C and a B, and a B and an A. The effect of that difference in range is to give missing assignments considerably more weight in determining a final grade than assignments of the same type (test for test, homework for homework, paper for paper, etc.) that were completed. Expressed another way, after receiving a zero it takes a whole lot of 100s to get the cumulative grade up to a D−. A teacher using this approach might be advised to announce to students and parents at the beginning of each term that, although the course is titled Algebra 1, for example, the grading methods employed expose the fact that it is really a work-ethic course—missing work counts for much more than work turned in demonstrating mastery of course content and skills. "We do a little algebra in here, but this course is mostly about work ethic." The second reason why entering zeros for missing work on the 100-point scale is counterproductive has to do with the effect of that practice on student motivation. As just noted, it can be very difficult to recover, gradewise, from a single zero, let alone multiple zeros. The result is that students facing such a situation often give up, having figured out that even if they work hard for the remainder of the term they will still end up failing the class. The math is against them. The result is disengagement and absenteeism at best, behavior problems and dropping out of school at worst. Teachers sometimes communicate the hopelessness of the situation directly to students. High school counselors have experienced situations in which a student comes to the office, often fairly early in the grading period, asking to be dropped from a class, stating, "The teacher says there is no way I can pass the class, so I might as well drop out." Such a request is a sad statement and counterproductive to our goals as educators. Finally, including zeros in the calculation reduces the validity of grades and misrepresents actual student proficiency, thereby eroding the accuracy of grades as indicators of knowledge of subject or course content and skills proficiency. It is unlikely that a student knows absolutely nothing—zero—about the content or skills under study. In fact, good teachers believe that it would be impossible given their expert instruction for a student who attends class even part-time to learn absolutely nothing—"I'm too good for that." A zero for missing work undermines the validity of any cumulative grade of which it is a part in that it measures something other than mastery of course content and skills. So, what alternatives are available for dealing with missing assignments besides recording and counting zeros in a 100-point, percentage system? The percentage system usually entails lumping all points earned during a grading period together and dividing by the total points possible to arrive at a term-average percentage that is then converted to a letter grade. Arithmetic averages or mean scores are disproportionately affected by extreme scores, and a zero in a 100-point system is an extreme score because of the disproportionate range between it and the lowest passing grade, as discussed earlier. One alternative is to calculate the median and mode scores for a unit of instruction, perhaps in addition to the mean score, to see which measure of central tendency best represents students' demonstrated knowledge of identified subject or course content and skills. Median and mode scores are not as sensitive to extreme scores as is the mean. A second option is to assign a range-equivalent score to missing work instead of a zero. For example, in the D-to-A scale of 60 to 100 points, a score of 50 could be entered into the grade book for missing assignments, which has the effect of weighting missing assignments the same as completed assignments of the same type. This approach addresses the mathematical issue associated with zeros in the 100-point system—unequal intervals between grades. The problem with this approach, and the reason I do not recommend it, is that it does not play well politically. Districts that have floated this approach to missing work (for example, Dallas and Nashville) have often faced a backlash from teachers, parents, and board members. "What? Students are given 50 percent for doing nothing?" Although the approach is mathematically justifiable, awarding students points for work not done, even if the point value recorded is below failing, just doesn't feel right. A third option is to jettison the 100-point scale in favor of a scale with equal intervals. For example, instead of the percentage system, assessment tasks could be scored on a 0-to-4 scale tied to a corresponding descriptive scoring scale, with uniform intervals between scores and zeros used for missing work. This is the scale I recommend and a topic explored in detail in Destination 2. Figure 1.2 shows how an urban district in the Midwest transitioned from a 100-point scale to an equal-interval scale, in this case with points ranging from 0 to 12. Note that students still receive zeros for missing work—there is no free lunch here. The difference between this scale and the 100-point scale is that of equal intervals. Now look at the difference this change makes when calculating unit or topic final grades for four hypothetical students, as depicted in Figure 1.3. The grades reported in the second column of Figure 1.3 are for different assessments of the same standard or topic, not different topics, and are listed in chronological order, left to right. Zeros indicate missing assignments. We do not know why the first student demonstrated a high level of mastery of the targeted measurement topic three consecutive times and then failed to complete the last assessment—and that information is important. What we do know is that almost all teachers viewing these data do not feel, at the gut level, that a grade of D+ best reflects that student's knowledge of the targeted material. And even fewer teachers say they would fail the second and fourth students. Again, one wonders, Why do we insist on using an assessment and grading system that yields results that fly in the face of teacher judgment? A strong argument asserts that failing to complete assigned work is a behavioral problem that should be dealt with using behavioral rather than academic consequences. Therefore, a fourth option for dealing with missing assignments is to insist that they be completed using natural consequences such as student contracts, parent involvement and sanctions, lunch detention, and Saturday school as leverage. For too many students, getting a zero for missing work and moving on is a reward—"Thank you. I didn't want to do the work in the first place." The natural consequence for not doing your work is having to do it—at a time and place not necessarily of your liking. The Zeros Aren't Permitted (ZAP) program is designed to increase expectations for students who repeatedly or occasionally fail to complete and turn in homework assignments or projects on time. ZAP emphasizes the belief that homework assignments and projects are important and must be completed. A number of school websites, including those of Norco Intermediate (http://www.cnusd.k12.ca.us/domain/4511), Costa Mesa High School/Middle School (http://cmhs.nmusd.us/zap), Guyer High School (http://www.dentonisd.org/site/Default.aspx?PageID=6468), and Jemez Mountain Public Schools (http://www.jmsk12.com/?page_id=1743), list ZAP strategies that teachers and schools use to enforce the expectation that choosing not to do assignments is not an option—or at least not an option without consequences. A final alternative to averaging in zeros for missing work is trend scoring, which is now included as an option in most grading software. The central concept is to assign a final topic grade or score based on a student's growth over the course of instruction rather than averaging scores earned at the beginning of instruction with scores earned later on. The assumption is that, with effective instruction, students will experience growth over time. Of course, some students may decide to disengage and therefore will receive lower scores later in a unit of instruction, but such disengagement suggests an emotional/behavioral problem that should be dealt with using emotional/behavioral strategies. With trend scoring, data points for missing assignments may not be significant factors when assigning final topic grades or scores if enough other evidence exists to support a conclusion. Chapter 4 includes more discussion of trend scoring. Other solutions to the zero problem are offered in literature on the topic (see, for example, Guskey, 2004; O'Connor, 2009a; Reeves, 2004; and Wormeli, 2006). Of course, every solution presents its own drawbacks. The point isn't that there is one right approach to the problem of missing work, but rather that it is wrong to simply ignore this elephant in the room. We have an obligation to our students and to our communities to collectively study the zero issue and its possible solutions, to define a shared approach to dealing with the problem, and to communicate that approach and its supporting beliefs and values to all stakeholders. Simply making people aware of the inordinate power of the zero—and the unintended consequences—can be an eye-opener and a good first step.